Third coming of Oakland duo serves up an accomplished spread for the heart and head. Revolution not included in tin instructions, but not really missed, either. There ain't nothing broken, where you at? The pistons pump perfect, where you at? The bass tone is Merlin, where you at? -- Aesop Rock, "Save Yourself"
It says something for the Bay Area's underground scene that the blurb sheet accompanying this album describes it as both "legendary" and... "burgeoning". For all the cult status of the Living Legends and Hieroglyphics crews in California, hip-hop cultural influence has remained firmly lodged on the axis between Los Angeles and New York, the recent upwelling in ranting crunksters and a certain paisley pantaloon-sporting duo aside. Yes, Quannum made a fair fist of things before peetering out in the past few years, but then DJ Shadow singlehandedly switched up the game production wise (he's the exclusion to the rule I just made up), and Gift of Gab can joyously pummel into the floor practically any MC in the history of breath control -- and they still ended up condemned to the college circuit, along with The Roots and other worthy causes whose acknowledgement far out-strips their platinum party appeal. For all the funk, soul and positivity on display, most people throwing up the West Coast summon the spectres of the D-R-E, Snoop "I ain't sayin' nothin' with my crip references, man" Dogg and that mum lovin' martyr who just happened to write one of the most withering fusilages of wrathful hatred in hip-hop history. Zion I may not be about to change that, but they're a worthy, talented duo and they're not going to hate, either; MC Zion claims Tupac "as a source of pride" for the Bay Area twice over on the driving crescendoes of the home repping "The Bay" (although it occurs to me that if everyone in the Bay did staaand UP as one, earthquakes would probably make the sea swallow it whole. Hmm). Having emerged with debut Mind Over Matter in 2000, they released the widely rated Deep Water Slang three years later, copped "Best Independent Album of the Year" nominations from The Source and VIBE (ohhhh savour with me the fatally neutering effect of that I-word) and ended up touring a lot with the likes of... Lyrics Born, J5 and The Roots. Now they're back to battle the curse of the Bay indie tag for a third time, this time on their own label and with Zion's lyrics taking on a more considered bent than erstwhile efforts. Not that this stops him from coming off as amiable lover of parties and women, though; heck, over the mariachi horns of "Doin' My Thang", a track that manages to recall both ATCQ (it's the jazzy flow) and Souls of Mischief (it's the chilled drift), he reminisces fondly about Too $hort being his "taste de jour" -- and Too $hort is never, ever going to wind up with an Independent Album award (or a negative bank balance statement... but that's enough about the pimp whose sales consistency makes Jay-Z look like Ja Rule). In practice he comes over quite like another Oakland MC, namely the perennially under-appreciated Aceyalone, albeit without the latter's intellectual darker side: jovially aggressive of B-boy stance and preferring simple, elegantly fun wordplay delivered in deceptively easy-going flows over dazzling complexity or vicious barking. Producer Amp Live, who has contributed to Goapele's sophomore album amongst others, offers a varied buffet while retaining a signature cooking style: live juke joint horns and Romani fiddles slide into the mix over filtered electro samples and synths, massively thick beats knock and bump over cavernous yet melodic subbass and the whole retains an organic, clean feel that is both powerful and bright. a fitting aural testament to his past sallies into drum&bass territory. There are raw breaker bangers like "Heads Up", prettily ethereal piano and strings on "Bird's Eye View" (where Zion delivers his version of "I Used to Love H.E.R." with conviction whilst referencing OutKast), tingling bedroom atmospherics and guitar on the more intimate affirmation of "Next to U" and an angry marching band vibe to "Amerika" that slowly ups speed before disintegrating into a brief surge of garage rock anarchy. Amp can provide detuned plucked acoustica that recalls Kieran Hebden and supply a soulful chorus to it that makes Talib Kweli feel right at home on "Temperature", host Gift of Gab with a joint that could have been on Blazing Arrow and dish up off-kilter double bass matched with eerie Asian woodwind on "Poems 4 Post Modern Decay" that must leave Aesop Rock, who delivers a superb first verse, wondering whether he's actually left Blockhead's studio (well, the DMX-referencing chorus might clue him in). Amp Live is a consummate craftsman of hip-hop sound. 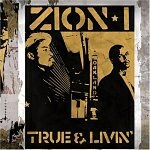 Between the two of them Zion I offer on this album a soulful and optimistic summary of the sonic and moral goodness in hip-hop's last decade or so; adversity is to be challenged and accepted, good times are to be had, musicians must keep doin' their thang because "hip-hop is beautiful" and, Dead Prez be damned, "hip-hop is life" and there's nothing bigger. Innovation is not huge on the cards lyrically or otherwise, but the conventional is delivered with character and faith, and it all feels contemporary. True & Livin' is not a challenge to the listener, rather a consolidation of a Bay Area hip-hop more than ready to take on the solipsistic negativity and processed beats that fester elsewhere. Buoyant music made for the people and the love of hip-hop itself, music that tries for uplift without stunning or remonstrating with the listener, music bowed but unbroken, hopeful. It's the world that needs fixing.